Gulls Emy Kiser battles for the ball against Kristin Cade of the Cascade Cougars. Annaka Garhofer goes for the basket. The Lady Gulls went from a 20-5 overall record and a third-place finish at state in 2016-17, to 8-17 overall and fourth place in the league standings last year. With the graduation of two all-league players, it won’t be any easier in 2018-19. 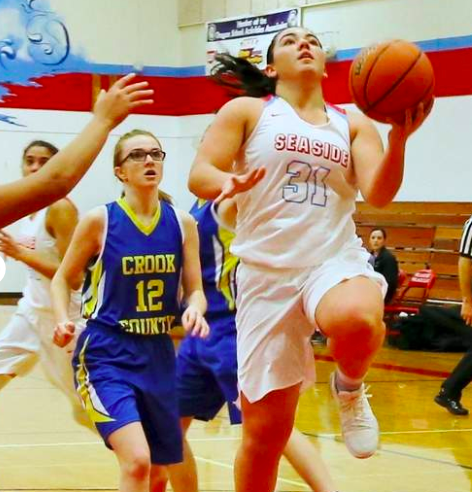 Seaside opened its season Wednesday with an overtime loss at Stayton — still not a bad beginning for the Gulls. Experience? Not a problem for Seaside this season. Hawes heads into the season with seven seniors on his 12-player varsity roster, with three juniors, one sophomore and one freshman with all kinds of potential. Meanwhile, the freshman is Lilli Taylor. 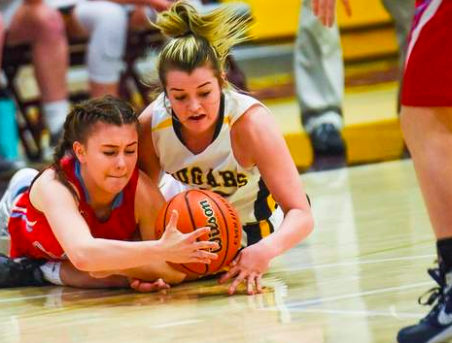 She scored 14 points in the loss at Stayton, her first high school game. Adding varsity experience are seniors Jessica Angulo-Joli, Annaka Garhofer, Alyssa Goin, Emy Kiser and Katie Zagata. Juniors Jadah Doney and Ruby Douglas, and sophomore Tristyn McFadden round out the roster. Playoffs: Defeated Scappoose, lost to Astoria in league playoffs.